Can’t believe a whole month has gone by since the last Draw A Bird Day (reprise) was celebrated on July 8! I hope both participants and viewers enjoyed creating / checking out the bird art! Here is the post from A-Wing and A-Way that informed us all of the official Draw A Bird Day holiday on April 8. This month, I plan to do a recap blog post in a couple of days with a link to everyone’s bird art work. I don’t want to miss anyone, so please add a comment on this blog post if you’d like to be included in that recap! The photo I found for this drawing was very helpful, as I wanted to see how detailed I could get with my little bird this time. Lyn Topinka of http://www.northwestbirding.com was kind enough to give me permission to use her photo, which can be found at this link. The kindness and generosity of photographers and artists alike continues to amaze me. Thank you so much, Lyn, for sharing your photos with the world on your site! This photo shows so much detail that it became a road map for my pen lines. It is a joy to draw with a photo such as this. It’s Saturday, and summer is beginning to wind down. Make the most of it in whatever way will refresh you best! Peace and happy chirping to all today! You are constantly inspiring me…with your art, your enthusiasm, and your positive energy. Thank you! Hugs!!! Yes, it would be fun to see a recap of all your bird drawings together. I love the detail you’re getting with the pen. This little fellow has quite a lot of personality too. Thanks! I’m enjoying the detail too, after painting in watercolor for so many days where detail is something you pretty much ever give up getting to (or at least I do) and the best I can pray for is to “suggest”. It’s been nice to draw with a good pen with a really tight shot and just see what can be done. I’m enjoying it. It’s kind of addictive, actually, and I never thought I’d say that about pen! Re the recap, what I’d like to do is do a post in a couple of days with a link to everyone’s bird art who participated in Draw A Bird Day. I should have been doing this all along! Thanks for participating; love your cranes! I thought you said birds weren’t your strong suit?! Birds in flight in particular I think are much harder so kudos! Thanks. Looking forward to all your birds! 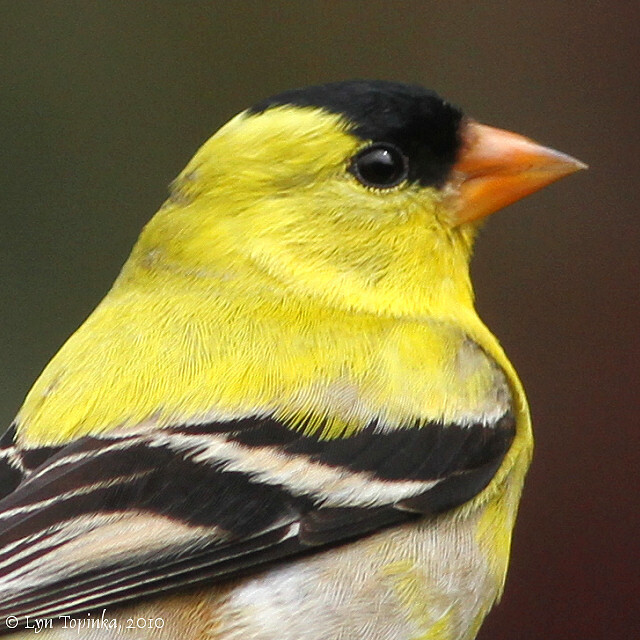 …it is just one, lovely little goldfinch. How delicate. Thanks, Lance! He was a lot of fun to draw. Would be much harder to paint! O M G ! It is time to quit your day job! !!!! Can I buy this one from you? I want to be the first customer of a famous artist! My hub would love this drawing. Laura – it is EXTRAORDINARY! You are so gifted in this area. So if she can, that would be so lovely of you! I am so excited for you to open a little shop! And – if you ever want to visit Mars 🙂 – you can deliver it personally and we could visit! Lol no my printer is a human! Her business is art and she is a friend and client. Her Giclee printers take up most of her living room and she told me months back that should could produce archival posters for me so that I could sell art prints, should I decide to go that route. The art journal has a spiral binding and between that and the size, not sure she’ll be able to blow it up very large. What size print would you like? Oh dear – lol – I completely misunderstood. I’ll take whatever size works! Lol ok. Wow, so you seem to agree with the others that this needs no background or color? Can I ask you – what about the cardinal head from a couple days ago. Same? I bet for sure she’ll be able to do an 8×10, Jodi! You’ve captured a beautiful bird moment. Beautifully rendered. Have a nice weekend Laura. I’ll be posting my bird on Monday. Aww, thank you Kathy! I really appreciate that! Do you have a favorite bird? Wow, Laura. You’re really growing as an artist! Keep up the good work! Thank you so much! There’s no stopping me now; I’ve got more fire and passion in my belly than I ever did before! I really admire your pen work in particular, so your compliment means a whole lot. Thanks again! Your artwork’s looking great, as always!!!! It’s amazing how you’ve turned Draw Your Bird Day into a monthly phenomenon! Thanks, Beth, and the same to you! I also want to add that the artwork YOU create is the type of thing I would be so frustrated if I even TRIED to do it. IMO God planned it this way; we all have something the world needs/wants. I think the journey is about discovering what that is and then nurturing and feeding it so it can grow bigger and bigger. My two cents, for what they’re worth! Wow. I really thought you’d have a hard time beating that lovely bird drawing you did the other day but this one is truly beautiful. Well then it seems practice has certainly paid off 🙂 It would definitely be interesting to see the difference. Heeeey! You and I are on the same wavelength! While I didn’t draw a bird just for this occasion, I shared a painting I did a while back of American Goldfinches on a sunflower. Your drawing is gorgeous! Really gorgeous! I saw it Teresa!!! I loved it!! I hope WP didn’t take its mighty phaser gun to my comment! Thank you, I’m really happy with this one. Ink?!? Who knew?? Wow! The daily practice is really paying off. You should do a gallery of birds to show your progress. Thank you, Maggie! I was thinking about posting the first bird I tried drawing last October lol. This is when I dug my heels in and decided I needed to learn to draw. So lovely and delicate. Keep up the great work! 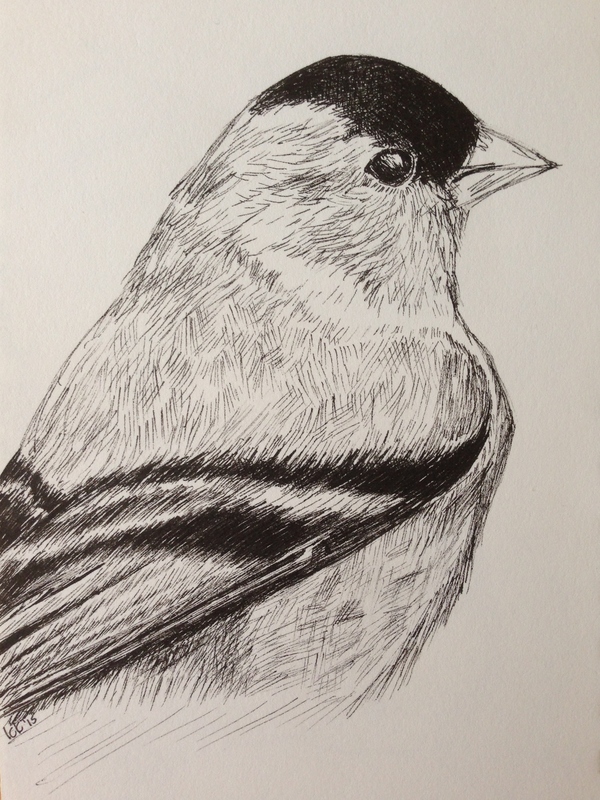 I’m really enjoying your ink drawings – this one is fantastic! And sure, if you’d like to include mine in the recap, that’s fine with me. Oh, just the blog name is fine, thanks! Absolutely wonderful bird! I’d love to see a convention of birds from yesterdays renderings. You’ll see it, Beverly! I’m glad you liked my little finch. I’m going to put together a recap in a few days. I know several people won’t be able to post their bird for a few days. I’m glad you joined us! Beautiful Laura! You can really work magic with a pen :-). You gave us some hints over that last few months, but now we all know for sure :-). Go for it Charlie! Sharon will post hers tomorrow and I’ve seen some others today. If you feel like trying one, I’d be glad to include your post in my recap, which I’ll do next week! Cool! Just posted my late entry! My first bird since grade school! Viola! Hehe…fun challenge! PS…and that is one gorgeous bird sketch!! Nice!! How about with perspective, Charlie? Same, just practice? Or would it help to really study perspective? I’d like to do more buildings, but especially for any type of cityscape, I feel like my perspective would really be out of whack. Lol you make that sound so simple! Can you pick any point? I thought it had to be a specific place that I never knew how to find. I simplify it because the technical pure perspective makes things look too mechanical. Hehe… I just observe the scene and sort of get the angle of the top of the building and the bottom to be right-ish, lines toward the middle straighten out and then curve again and all vertical lines are straight up and down. Just try getting the outer contour to feel sort of right of each side of the building that you see, and then move inside for the other lines. Thank you; I’ll try that. I appreciate your help! The hatching is lovely…I can imagine how much patience and time it took…great work! I probably will try one soon! Thx for the encouragement. Loved your lavender painting! Thank you! I really enjoyed drawing that one. I am inspired by your work, I love to draw a bird soon. I hope you do, Magny, thanks!